Back in their labs, scientists led by biochemist Robert Hanus of the Academy of Sciences of the Czech Republic in Prague went on to show that the blue termites always had shorter, worn-down mandibles than others from the same species, indicating that they were older. Then, the researchers removed the contents of the blue pouches and analyzed them. They contained a novel protein that is unusually rich with copper, suggesting that it's an oxygen binding-protein. Rather than being toxic itself, it likely is an enzyme that converts a nontoxic protein into something toxic. 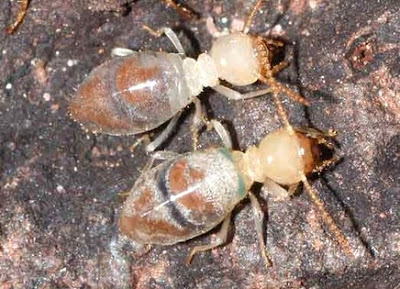 "What happens is when the termites explode, the contents of the back pouch actually interact with secretions from the salivary gland and the mixture is what is toxic," explains Hanus. It's the first time two interacting chemicals have been shown responsible for a defense mechanism in termites..."
From the context of the article, my interpretation is that the "exploding" referred to is not an expansive force, but rather a "rupturing" of the termite. Embedded photo cropped from an image by R. Hanus. Via Neatorama. Addendum: Danack found a video of the rupturing termite. Warning: not very exciting. And it looks like the toxicity of the leaked fluid is not very dramatic. Thanks; I'll add that link to the post. Why do some people want to squish turtles ? Prolonged drought threatens our electricity ! Janis Ian sings "At Seventeen"
Wherein I learn about "gestation crates"
Did I just dodge an "upsell" from Subaru ? What will happen when the Ogallala runs dry ? Make your own "taco bowls"
A possible etymology for "give a dam(n)"